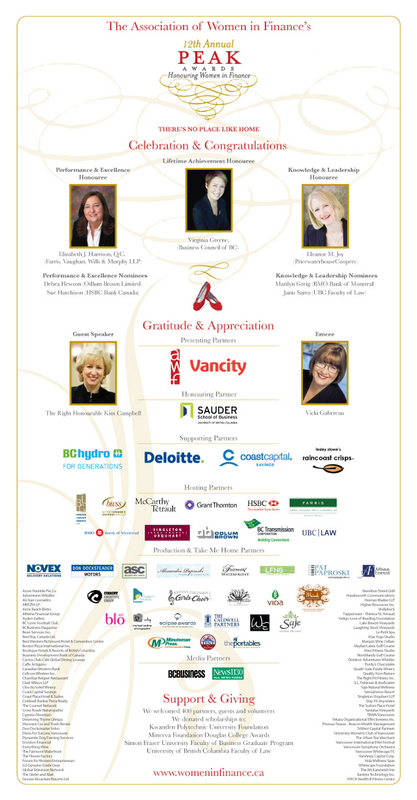 A sold out crowd of 400 guests attended the 13th Annual PEAK Awards presented by Vancity and the Association of Women in Finance on May 5th, 2010. 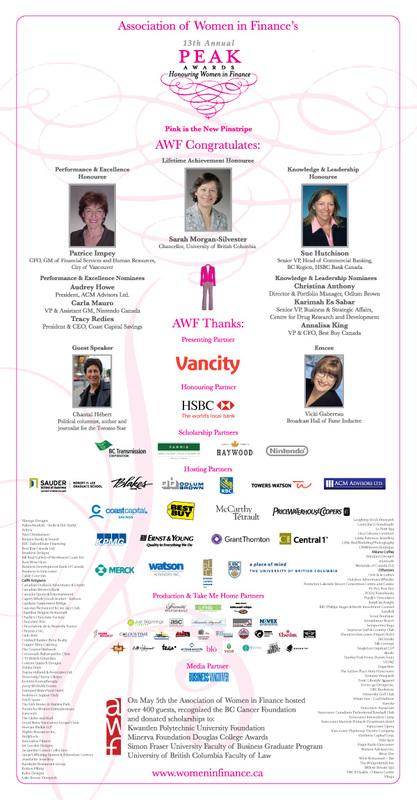 This “Pink is the New Pinstripe” themed evening was hosted with thanks by Vicki Gabereau and featured “At Issue with the AWF and Chantal Hebert". Over 350 guests attended the 12th Annual PEAK Awards and Gala and Fundraising Dinner presented by Vancity and the Association of Women in Finance on May 14th, 2009. The AWF wishes to thank our host, Vicki Gabereau, and Keynote Speaker, The Right Honourable Kim Campbell who delivered an inspired address on our theme of "There's No Place Like Home". Through the generous donations of our partners and attendees, the silent auction and raffle portion of the evening raised over $16,000 for our Scholarship Fund.